Peel Ports’ flagship deep-water container terminal, Liverpool2, will welcome its largest regular caller to date when 2M (Maersk and MSC alliance) introduce a new transatlantic container service to the port beginning 22 July 2018. 2M is switching its TA2 service from Felixstowe to Liverpool on a temporary basis. At the same time, Maersk Line’s South American service, Colombia Express, will also start calling at the port of Liverpool, exporting UK goods to Newark. 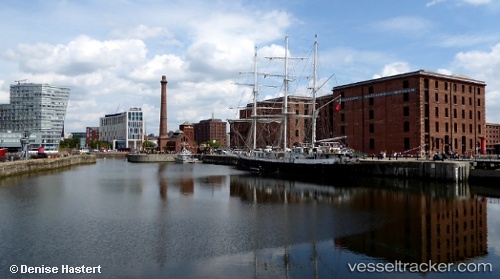 Liverpool will be the final port of call for both weekly services as they head westbound across the Atlantic. The ships will load UK export cargo such as Scotch whisky, food products and trade machinery. The new services will also see the Port of Liverpool open up direct links with the US ports of Charleston and Savannah. Construction work has started to build a new cruise terminal in Liverpool, UK after plans were approved in April this year . An overwater jack-up platform has started site investigations on the bedrock where the new facility will be built. The new permanent terminal, which will replace the current cruise facility, will enable the city to accommodate the world’s biggest cruise ships on the UNESCO World Heritage waterfront. “Liverpool is used to welcoming majestic vessels to the Mersey, like Cunard’s Queen Victoria the other day, but this unusual looking jack-up platform is arguably our most critical visitor this year given the importance of the work its carrying out,” said Joe Anderson, Mayor of Liverpool. UK ports operator Peel Ports Group and autonomous vessel firm ASV Global recently tested an autonomous shallow-draft survey boat at the Port of Liverpool. According to Peel Ports, it represents the first step in a partnership to explore the use of the technology at its other sites in the UK. For the first test, the ASV-built autonomous boat C-Cat 3 carried out a multibeam echosounder survey near Brocklebank Dock, a terminal on the River Mersey north of Liverpool. The demonstration was successful, and Peel Ports is exploring the possibility of further uses for the survey technology. It has signed a formal MOU with ASV that will give the autonomous systems developer access to other Peel Ports facilities for further testing.